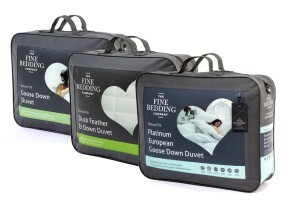 The Fine Bedding Company has been family run for 4 generations, their knowledge and experience combined with a serious commitment to manufacturing the very best duvets and pillows has resulted in their award-winning range of bedding. The Fine Bedding Company have a simple yet effective set of principles: design and develop market-leading products using top quality material, minimise adverse effects on the environment whilst retaining the high manufacturing standards needed to make their superior bedding. The Fine Bedding Company’s commitment to environmental protection and enhanced efficiency is a significant factor in the recent repackaging of a large proportion of their range. Several new products have also been introduced to the range along with refreshing and revitalising existing products that have defined the brand. The Spundown range is possibly the most popular range of bedding and it is certainly comprehensive, including single, double, king and super king duvets in 5 different togs as well as the 4 seasons version, 2 types of pillows and bedding protectors. Spundown duvets feature quick-drying microfibre covers and are filled with 100% Smartfil® microfibre, which is lightweight yet luxurious. The pillows have a Firesafe cover made with 55% cotton and 45% Modacrylic – a soft, strong and resilient synthetic fabric which is also flame retardant. The range is non-allergenic and can be washed at 60oc, the temperature which kills dust mites. The ne w Platinum European Goose Down range is the epitome of indulgence, featuring a 100% cotton jacquard cover with 80% goose down / 20% goose feather filling which gives it an unrivalled softness and natural warmth. It is one of the lightest and most breathable ranges of bedding on the market. The next new range is the 60% Goose Down range which offers a cosier, more tucked in feeling and has a 100% cotton cover and a 60% goose down / 40% goose feather filling. The pillow is ideal for anyone looking for extra support which is provided by the plump feather core and sumptuous down surround. The new Boutique Silk range is outstanding in its quality – the sort of opulent bedding you’d expect to see in a luxury 5 star hotel! A 100% cotton cover encompasses a filling made of 90% Smartfil® microfibre and 10% pure silk, this really is bedding at its finest! 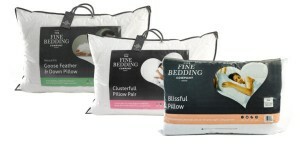 The range is non allergenic, washable at 60oc and the pillow has a Firesafe cover just like the Spundown. The Soft Embrace is an affordable range, although it’s affordability by no means compromises the quality and comfort of the bedding. The polyester / cotton blend cover and 100% polyester filling provide the luxury that the Fine Bedding Company is renowned for. The range features 3 different tog duvets along with a medium support pillow and 100% poly-quilted pillow protector. The new range is supported by a selection of pillows, mattress protectors and pillow protectors. The new Blissful pillow offers medium support, it’s covered with peach soft polyester and has a 100% polyester filling which provides good warmth and comfort. 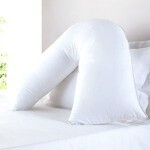 The Blissful pillow is washable at 40oc and is non-allergenic. The new Deep Fill Cotton protectors for mattresses or pillows have a 100% cotton cover and the filling is made of 90% pure cotton blended with 10% reclaimed cotton – which is made by gathering and reprocessing the scraps and excess yarn that is generated during manufacture. These protectors are highly breathable, naturally soft and are designed to also enhance comfort. The Classic Cotton pillow protector is 100% pure cotton and offers the unmistakable freshness and comfort cotton is well-loved for. The existing range of duvets, pillows and protectors from The Fine Bedding Company is comprehensive and is bound to include the bedding that is just right for you. The Duck Feather & Down duvet is wonderfully warm, breathable and its natural extra weight gives that “tucked-in” feeling, the Duck Feather & Down pillow is naturally soft and plump and will provide medium support. The Goose Feather & Down duvet boasts very similar properties to the duck version, however it is slightly warmer and heavier, perfect for those who feel the cold. Both of these natural duvets are available in several sizes and weights and feature cassette pocket construction which evenly distributes the filling thus avoiding cold spots and the filling doesn’t bunch up inside the duvet cover. The So Soft duvet is filled with Wispelle™ material, which is a specially blended microfibre which offers superior breathability and softness, and covered with peachskin microfibre for a snug and cosy feeling. The So Soft duvet is washable at 60oc and non-allergenic for a healthy, comfortable night’s sleep. The naturally hypo-allergenic and breathable Tranquility duvet is filled with luxurious microfibre which not only offers comfort and warmth but it drapes beautifully and its textured polyester cover adds to the classy look it evokes. The range is completed by several innovative pillows, protectors and toppers. The V-shaped pillow provides natural support for neck, back and shoulders and its polyester cluster filling comfortably cradles the head. It is machine washable and replacement covers can be purchased separately. The Clusterfill pillow is filled with soft and fluffy hollowfibre clusters has a 100% cotton Cambric cover, which is a fine weave cotton fabric which is glazed on one side to make it down-proof, which ensures a wonderfully plump and luxurious pillow. The Sleep In Silk pillow is filled with a sumptuous silk / microfibre blend which results in an indulgent sleep experience. The Memory Foam Dual Support pillow offers medium-firm support and uses a clever combination of Memory Foam, which is temperature-sensitive and will alter to support you where you need it to, and down-like microfibre for incredible comfort. The Perfect Balance pillow protector is filled with Lysoft, an advanced fibre blend made from raw materials and polyester, which absorbs and disperses moisture thus regulating your temperature and allowing your body to breathe. The Complete Care Plus mattress protector is washable at 95oc and has a dual face with cotton towelling on one side and a fully waterproof reverse. The Complete Comfort mattress protector is 100% waterproof and incorporates quilted hollowfibre layers in a soft microfibre cover with an elasticated skirt. The Clusterfill mattress topper has a hollowfibre cluster filling which moulds to the contours of the body for optimal comfort. The non-slip Memory Foam mattress topper utilises temperature-sensitive technology to adjust itself to support you when and where you need it most. We spend up to a third of our lives in bed and The Fine Bedding Company’s range of bedding, with either practical synthetic fillings or splendid natural fillings, is designed to make sure you have a blissful night’s sleep. For more information on choosing the right duvet, including which size and tog rating to choose, please feel free to visit our previous blog “A Guide To Duvets”. 60% Goose Down, Boutique Silk, Breathe, Duck Feather & Down, Goose Feather & Down, Machine Washable Duvet, Platinum European Goose Down, Soft Embrace, Spundown, The Fine Bedding Company. Bookmark.